In celebration of Dr. King's birthday, the Brookings Human Rights Commission sponsored its Annual Dr. Martin Luther King, Jr. Day Contest for all Brookings students. Dr. King was a supporter of human rights and freedoms for all citizens. 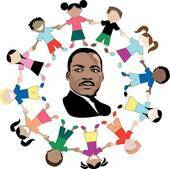 Dr. Martin Luther King, Jr. Day will be celebrated on Monday, January 15, 2018. This contest was designed for students to reflect on Dr. King's ideas and the effect on our community through their contest entry. Mayor Keith Corbett will present the winners with their awards at the City Council Meeting on Tuesday, January 23, 2018, at 6:00 p.m.
Middle School & High School Essay Contest Theme: "True peace is not merely the absence of tension; it is the presence of justice." Elementary & Intermediate School Poster Contest Theme: "We may all have come on different ships, but we're in the same boat now."